For the past week or so, Richard Linklater’s Boyhood has been expanding all of the country. And the response from nearly every critic and everybody that I know that has seen it says that it’s a masterpiece. Last Sunday, I went and saw the film again, after seeing it in January at Sundance (that review here). Ever since I saw the film at the prestigious film festival, of course I thought it was brilliant, and easily one of Richard Linklater’s best films to date, but I wasn’t thinking that it was the very best film of the decade. Maybe it just hadn’t come to me, or maybe it was due to the fact that I saw the film at 8 in the morning (which was 7 o’clock here in Austin). But ever since I saw this brilliant little gem, I could never get the film out of my head. I could remember nearly every little detail of the film, which says a lot for a film that I had seen previously. I didn’t see the film at SXSW, but a good friend of mine did, and he told me that he didn’t care for the film. I don’t know if he was trying to act cool and hip, going against the response of everybody else, or if he had some other agenda. We argued for weeks about how he didn’t love the film, and the film started to come back to me in a major way. When IFC begun to get the marketing campaign for the film, with posters and trailers, it all started to come back to me, how truly beautiful and moving this film was. And so I come back to seeing the film with my best friend at a packed art house theater in town. And after the lights came up, the love that I had for Boyhood had officially been realized. Boyhood is hands down, the greatest film of the 21st century. Not to mention being the best film of 2014. I don’t believe I’ll ever see a film this emotional and honest all year. Yes, I’m sure films like Gone Girl and Interstellar are going to be great and I’ll love them, but they probably beat Boyhood. I still can’t get over the fact that Richard Linklater and his cast, which consisted of Patricia Arquette, Ellar Coltrane, Mr. Linklater’s daughter Lorelei Linklater, and Ethan Hawke, could commit to a 12 year project that seems to big and ambitious, but the finished product is so small and intimate. I think that my review of the film from Sundance is heavily flawed because I was still so polarized from seeing the film, even though I wrote it a few days after I got back to Austin. I remember having a few nitpicks with the film when I saw it at Sundance because I’m a terrible film critic, but I had thought that the journey was worth it, and I missed seeing Mason once the credits started rolling. When I saw the film a second time, it’s as if the emotions were bigger for me. The nit picks that I thought that I had with the film were completely out of the question with this second viewing. I think that Boyhood is a perfect film. I think this film is perfect because I’ve never seen a coming of age film that is as accurate and as emotionally real as Richard Linklater’s Boyhood. Mr. Coltrane is a couple of years older than me, but not by so much, so a lot of the things that the character of Mason was into, I was as well. The cartoons, video games, Houston Astros baseball (that died out for a me a few years back), and music. Maybe just as a boy who happened to be born and raised in Texas, I have a much bigger attachment to this film that most film critics, but I don’t really have to defend that. Mason’s story growing up is one that I felt deeply personal on my benefit, with several scenarios in the film that hit home incredibly hard for me. The scene where a panicked Patricia Arquette has to get her children out of an abusive household from an alcoholic college professor is one that’s a very sad and frightening scene. The sequences with Ethan Hawke being a dead beat father for the first couple of years, then years later returns as a better and more composed man than before, is one of the very nice moments of this film. I think another thing that makes Boyhood really special is the near perfect depiction of Texas on film. Mr. Linklater is a handful of filmmakers that can make life in Texas look actually believable and not horribly stereotypical and drawn out (I’m looking at you Transformers 4). A good chunk of the film takes place in Houston, Texas, where we get a good feel of all sorts of life in Houston, from the suburbs, to the beautiful museums (the Natural Science Museum in Houston, which I spent a lot of time there as a child, makes a nice appearance here in the film), and even the Astros game, with national traitor Roger Clemons making an pitching appearance in the film (I’m still very bitter about the whole situation). We then see Mason move around quite a bit, from San Marcos to him taking a road trip to Austin, and then eventually to college where the final scene sees Mason at the heaven-like Big Bend. Nothing about this film feels fabricated or fake or phony. It all feels real, and right. It was even great to see Charlie Sexton, a local musician here in Austin and a family friend, make an appearance in the film. The life in San Marcos and what looked like Llano, Texas in a few scenes, as well as the cities mentioned above, all feels like those cities. Austin is cool and hip, Houston is as culturally diverse as it always has been, and even the Bible belt of East Texas makes an appearance in the film, in one of the funnier and more heartfelt moments of the film. But I should quit telling you every little detail of this film. I say this because I must wrap up writing about Richard Linklater’s Boyhood, because I must tell you to go see the film if you haven’t seen it yet. I can’t reiterate it enough, but Boyhood is a masterpiece 12 years in the making, and in my opinion, Richard Linklater’s magnum opus. Of all the great films that Mr. Linklater has brought us through the years, I don’t believe I’ve ever gotten so emotional like this one in any of his films. Richard Linklater is the greatest filmmaking of my generation, and without his films, it would be pretty hard to love movies the way I do. Mr. Linklater deserves that long awaited Oscar for this film, not just for screenplay, but for Best Director. I don’t believe that I will think differently about this decision in the near future. Such an ambitious and beautiful film deserves that kind of reward and respect for a wide audience. Mr. Linklater didn’t use any special types of 3D or special effects to tell this story. It’s all real, every frame and detail of this moving and beautiful story. If there is one film you must see this summer, hell if there’s one film you must see all year, forget all the dumb blockbusters and Oscar bait. 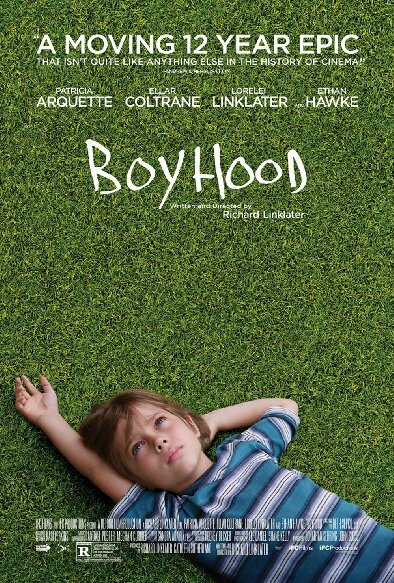 The one film you must see is Richard Linklater’s Boyhood, the greatest film of the 21st Century. July 26, 2014 in 2014 Film Reviews, Movie Reviews. Hands down one of the best films ever. Had to go to Houston to see it because small towns like Galveston in Texas don’t show avant-garde movies like this. I sure do miss Austin.